Storms and flooding incidents can occur with little warning. Although modern weather forecasting methodologies have progressed by leaps and bounds over the last few decades, it is still difficult to know in advance just how much damage a natural disaster like a hurricane or heavy rainfall may bring to individual homes. At Chenal Restoration, we are prepared to deal with all types of storm and flood damage. As one of the most respected names in property restoration services in Little Rock and surrounding communities in Arkansas, Chenal Restoration is dedicated to providing exemplary solutions to bring your home or commercial property back to its pre-loss condition. We are part of the Disaster Kleenup International network, North America’s largest disaster restoration contracting organization. We rely on our team’s extensive experience in dealing with all sorts of water disaster situations in order to offer leading-edge storm and flood damage restoration services. Whether your home has been damaged because of hurricanes, heavy rains, tornadoes, high winds, snowfall, or blizzards, our restoration professionals can back you up immediately. We provide emergency services 24 hours a day, 7 days a week, ensuring that the challenge you are facing will be dealt with as quickly as possible. With fast disaster response on your side, you can expect to go back to living your life as usual in no time at all. When storm or flood damage cause problems on your property, don’t delay. Call Chenal Restoration today at 866-971-5098 , and we’ll help you restore your home or office, even when things appear to be at their worst. 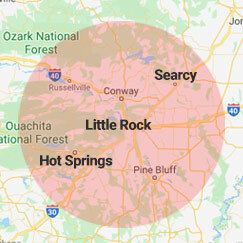 Our team is fully licensed and insured, giving you the peace of mind in knowing that you are covered by one of the best disaster restoration service providers in Arkansas.